Video games have got a graffiti problem. So much video-game graffiti is dumb, unrealistic, or hamfisted. Considering that I've gone out of my way to criticize games that get graffiti wrong, it seemed worth taking the time to high-five a game that gets it right. 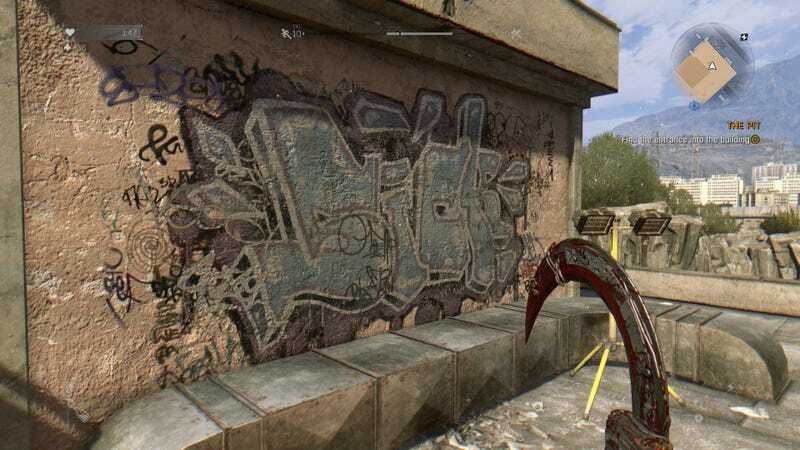 Dying Light developer Techland could've very easily screwed up the graffiti in their game. I'm almost surprised that they didn't, that the city of Harran isn't covered in scrawled, apocalyptic messages: "DOWN WITH THE GRE," "WE ARE THE ZOMBIES," "ALL OUT OF HOPE," that sort of thing. I've been taking screenshots of graffiti anytime I see it in the game. As you can see from these screenshots, there's a fair bit of repetition. Fortunately, the variety is mostly good enough (with a few exceptions) that if I weren't paying close attention to it, I probably wouldn't notice the dupes. In other places, survivors have left messages on walls and buildings, but those messages are almost always functional and believable. So: Good job with the graffiti, Dying Light! You get a gold star.